Morning of September 13, 1975. Saturday. Somehow, my best friend Toby T—-r and I end up in a very isolated area of Australia (I do not recall any backstory other than the perception of having walked over an embankment), seemingly far inland, with no towns close by in any direction. 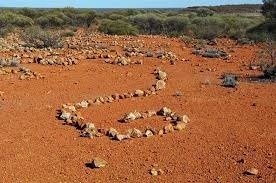 It is apparently an isolated place called the “Boneyard” and is seemingly a special archaeological site relating to Australian Aboriginal rituals as well as lost treasures and gemstones, mostly opals. There are rocky hills in all directions when we explore one area. At one point, it seems like a school field trip even though I feel as if I am an adult. We find ancient artifacts which are supposedly very valuable in addition to various smaller human bones. We do a lot of work and at one point, are trying to interpret carvings on old stones. We put everything in the same large grayish green bag. I am not sure of the material. I do not think it is burlap. After a time, a dangerous snake shows up (I am unsure of the species, but it is perceived by my dream self as venomous, and is possibly a krait). One of us, I am not sure if it was Toby or me, as there seems to be a jump ahead in time at one point, apparently had trapped the snake in the bag earlier without considering it was what we were using to put the artifacts in. We later gather several more valuable items to put in the bag. There seems to be some sort of argument (non-violent) about possible translations on some Aboriginal dreaming stones or whether certain ones were made by Aborigines or pirates. Near the end of my dream, there seems to be some sort of ironic special ending about getting to the valuable artifacts. Because the snake is in the bag, we would not be safe if we put our hands in it. This seems to be some sort of O-Henry-like dream climax, but in reality, there would be a few options to getting the artifacts, yet in my dream they somehow ultimately seem inaccessible. Prescient threads: It is pertinent here to go into the precognitive dynamics of this dream before the usual core symbolism. Although my “mystery girl” (dream girl) is not present in this dream, it does take place in Australia. Not only that, Zsuzsanna, when I learned many years later that she was a real person, had not only been to an area to find opals when she was young, she also has an Aboriginal Churinga dreaming stone of the same appearance as one which featured in this dream. This is especially curious as I had no viable knowledge of such things when this dream occurred (and did not really know much about it until after coming to Australia). Additionally, this dream took place on her birthday, though “mystery girl” dreams certainly were not restricted to literal markers. RAS symbolism: This dream amused me with the nature of its intriguing ending. There was no real threat, as I had started to enter semi-lucidity in the final stages. A snake is often the core RAS dynamic (likely the oldest waking trigger in all primates, including man). Toby is present for preconscious mediation with only mild conflict relating to reading (translation) skills, which symbolize the emergent consciousness factor (as critical thinking skills normally do not function in dreams). The bag with the snake inside is likely associated with waking space and RAS – analogous to a pillow case, as it was about the same size as one. As such, the bag could be typified as a second-level dream state indicator, that is, residual subliminal memory of having fallen asleep (as it is biologically impossible for the mind to not be aware it is sleeping and dreaming, which is why much dream content is based on the dream state itself in the inherent nature of waking from sleep).